If you think sweet guys can only be found in romantic comedies, think again. Menard Dacono and Franilyn Sendiong are one of the few lucky ones who found love at the right time and in the right place, just like in the movies. It may have been a blessing in disguise when Franilyn’s former boyfriend broke up with her to be a priest. This was the time she met Menard – a friend’s brother. Their relationship started with a few dates and getaways all over the Philippines as friends until the time came when Franilyn realized the sincerity of his love for her. When she moved to Singapore, Menard quit his job to follow here there—that’s when she knew he was the one. Menard’s proposal was no ordinary one. He planned a surprise proposal in Jewel Cable-rid dinner in Singapore and a splendid river cruise dinner in Bangkok. Franilyn felt like a queen and the star of her own romantic movie. Franilyn and Menard started the wedding planning by looking for a theme that would be modern, fun, exciting, romantic, whimsical, and something close to their personalities as a couple. And since both of them were movie addicts who can go through a whole day just watching movies, they thought why not a movie themed wedding? Their wedding featured different movie genres such as drama, action, comedy and romance. They executed this in their Singapore classic movies pre-wedding shoot and Philippines underwater shoot and put them up movie posters and billboards. Moreover, there were cinematic videos, greetings from around the world, grand church decoration and a Moulin-Rouge wedding reception set-up with different movie centerpieces. They also used soundtracks from the Oscars, cool right? 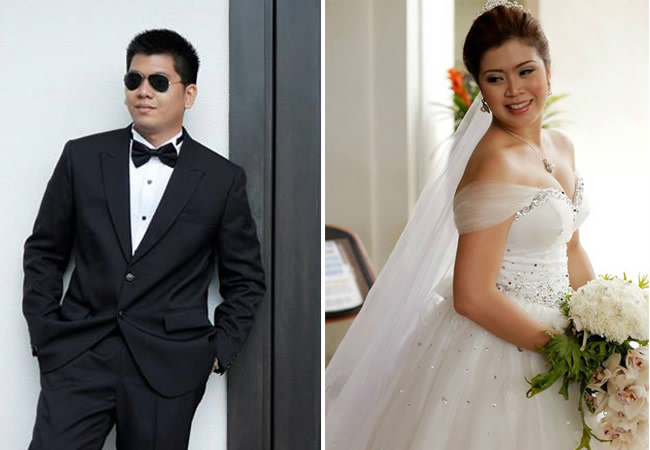 Their beautiful movie wedding was made possible by the best wedding suppliers in Davao, Manila, and Singapore. EIGHT PRODUCTIONS expertly captured their Mindanao Movie Wedding in photographs and videos. They were also very happy with their wedding invitations made by WINK Written in Ink as well as their mobile bar by Cocktails And Dreamsz Mobile Bar. Franilyn and Menard thank them for their utmost dedication, positive heart and professionalism. 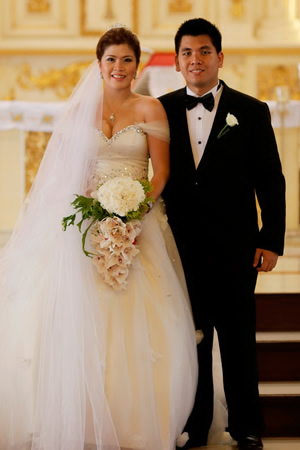 For Franilyn and Menard, the wedding is a once in a lifetime event that should be memorable and fun. They advise couples to plan early (a year) in order to get the best wedding suppliers and early wedding booking discounts. Planning early also means less stress and having the time to take care of last minute adjustments. For more Real Weddings features, visit Kasal.com Real Weddings.